HAL has bagged a major Defence contract for supplying 14 Do-228 aircraft produced by HAL to the Indian Air Force. “Apart from these aircraft, the contract valued at around Rs. 1090 crores includes six reserve engines, one flight simulator and associated equipment”, says Mr. T. Suvarna Raju, Chairman, HAL. “This also reflects the trust of the Defence customers on HAL and we remain committed to supporting Indian Defence Services for all their needs”, he adds. 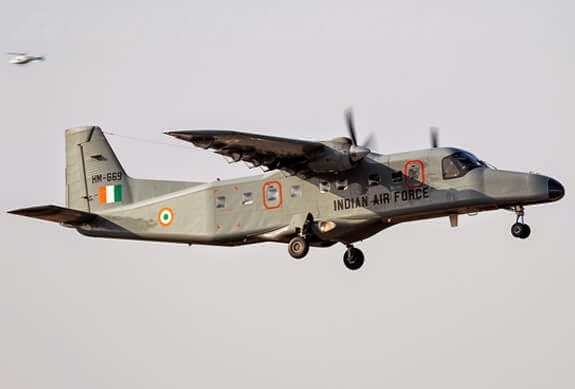 HAL Do-228 aircraft will be manufactured by the Transport Aircraft Division at Kanpur. The Division has expertise in manufacturing of transport and trainer category of aircraft and has till date manufactured 125 HAL Do-228 aircraft for various defence and other customers. This aircraft has been exported to Seychelles and Mauritius. Last year, one Dornier was also supplied to Bangalore based Electronics and Radar Development Establishment (LRDE) to be used as flying test bed (FTB) for evaluation of performance of various radars being developed by them. Dornier-228HAL Do-228 is a highly reliable, multi-purpose, fuel efficient, rugged, light weight twin turboprop aircraft with a retractable tricycle landing gear. The cockpit is designed to accommodate two crew members and is fitted with duplicate controls. The cabin can accommodate 19 passengers in commuter configuration. The general features are maximum take-off weight-6400 kg, maximum payload - 1903 Kg, fuel capacity- 2850 litre (2250Kg), maximum cruise speed- 428 mm/hr, service ceiling-4299 M, engines - 2 garrett TPE 331-5-252D engines each driving a four bladed reversible pitch, fully feathering propeller. The versatility of HAL-DO-228s are due to several in-built features such as highest fuel carrying capacity in its class (2850 litres) due to integral fuel tanks in wings, low structural weight ensured through use of advanced composite materials, high wing design for unobstructed view and radar coverage, wide wheel base for better stability, short take-off and landing capability- the aircraft can take off from around 700 m and land within 575 m- essentially required for operations from short and semi-prepared airfields, sturdy landing gears, rectangular cabin offering more head space for passengers and mounting space for equipment in case of special mission configuration as opposed to circular cabin, low floor level and wide door for easy loading/unloading of cargo, flight openable roller door, four wing hard points for mounting of external loads up to 1030 kg, optimum performance at normal cruising altitude for short haul applications enabled by the revolutionary design of wing aerofoil. HAL has fitted several role specific equipment on this aircraft to meet the specialized requirement of its customers. To keep the aircraft contemporary with latest technology developments HAL continuously strives through its strong research and design base, to develop and integrate new modifications.